Wings, ribs, beer and lots of new menu items! Come out for some fun! 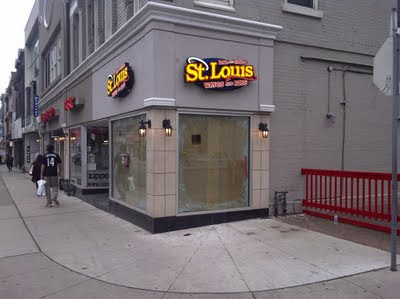 @Stlouiswings is celebrating 1,000 followers by giving back to the community. 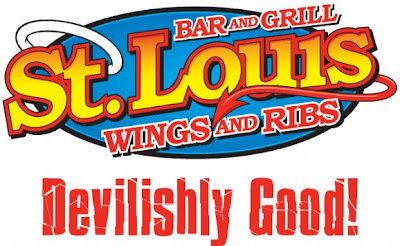 St. Louis Wings and I will be inviting you on Saturday May 28th to a free meal and drink in celebration of a new location at 528 Yonge Street. Come join in on the devilishly good time all day. So come out and let's get social over some great food and company! RSVP via the four following time slots. 1 RSVP per person. *Date is subject to change upon construction completion* If you have any questions, Contact us at @Stlouiswings or @clickflickca on Twitter. See you soon! To register all you have to do is send a tweet with this hashtag #528YongeStLouis. with the mention of one of St. Louis Wings menu items. Visit St. Louis Wings website for menu options. Be creative and you might win something too! Then click here to RSVP at one of the time slots. The new location is set to open at 528 Yonge Street on May 28th. So Join us! I got the chance to watch my very first professional soccer game about a week ago and thoroughly enjoyed the experience. Here are the collectable scarves we each received for the game! Yes, those are my flourescent shoe laces! At the game I noticed that the fans or as the football fans call it "Supporter" groups really get into the game. They chant, shout and scream like I've never heard in a different sporting venue. Win or lose you can tell these fans are diehard. In this pic the fans are so raucous that fans sometimes get carried away! See the broken chair for details. Mind you it was fixed in less than 5 minutes! Just to add more to the already exciting time at a TFC game we also had the opportunity to hang out on field level to take photos and touch the real grass. Thanks to David Barker. Now with all the excitement and fun in the sun I had to have myself a wobbly pop. This was the first time I had the Carlsberg beer and it was a thirst quencher to say the least. 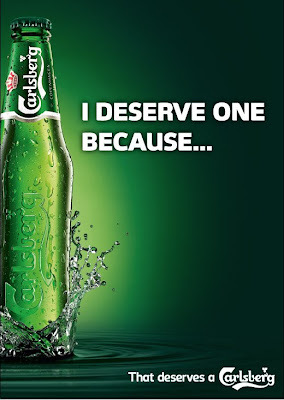 Lucky for me Carlsberg reached out to me and I'm telling you about a special promotion they have right now. 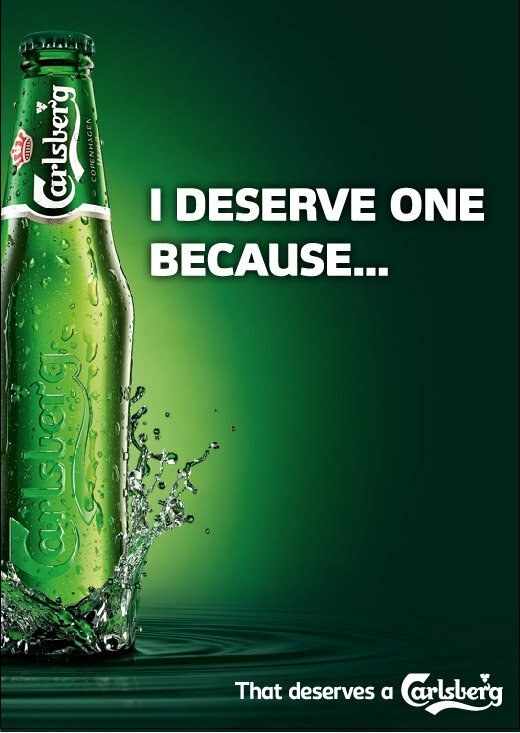 If you visit the Facebook fanpage Ideserveone.ca You have a chance to win a Carlsberg prize pack every Monday. So check out the App here too! CarlsbergCanada Good luck! I thought this was funny! the game within the game. All in all, it was a great time had by all. So check out TFC to purchase tickets to upcoming games and visit IDeserveOne for a weekly chance at prizes from Carlsberg Canada. So tell me why you want a Carlsberg? Hoccer Iphone App is like Ultimate Frisbee for nerds. Have you ever thrown a frisbee? Then you will like this Iphone App. You maybe wondering what the correlation is but it's a cool new App I discovered through my cousin when we had dinner recently. It's an App that works on Iphone and Android (No blackberry App at this time). It allows you to pass pictures, contacts, music or text with a simple gesture. Just launch Hoccer and select a photo/contact or music and "flick" in the direction of the other user. The other user will swing their phone in a motion as if to catch a tennis ball and "Voila" the transfer has been made. You can also line two smartphones together and swipe a file from one phone screen to the other with the drag of your finger between the 2 phones. It simply is a great App because it uses your body motion as part of the technology. In this screen shot I received a music photo cover. It looks like you can add photos, contacts and text and more options look to be added in future updates. In the above screenshot, this is the motion you need to create to transfer and initiate the exchange. It's the same motion as throwing a frisbee. How cool is that? So this App is similar to the "Bump" App but without actually bumping the two phones. It's all based on your geolocation. I'm also told you can send or "hoc" to another person within 100 meters. Now get your friends and family on it and see how cool it is to transfer all kinds of media types. The App is free and you can find out more here Hoccer So give it a try and tell me what you think. I know you'll like it because it's easy to use!